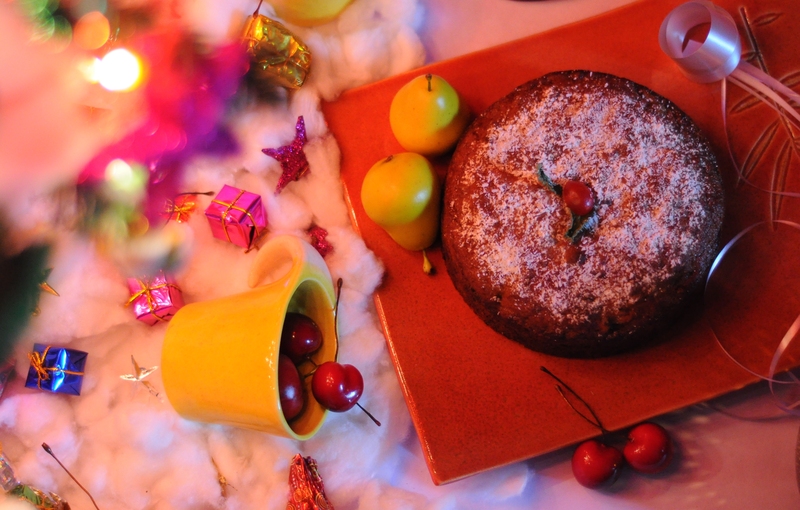 With five days to go for mandatory merry making, we’re putting on the apron and oven mints to whip up a sublime treat…a warm and dreamy Date and Walnut Cake that tugs at the heartstrings, feels like a hug and pulls friends and family real close. 2. Chop walnuts and add it up the dates mix. 3. Sieve flour with baking powder and mix half the flour in the dates and walnut mix. 4. Cream margarine and add powdered sugar. Beat till light and fluffy. 5. Beat eggs and add to the mixture. 6. Fold the dates mix and the remaining flour. 7. Bake in a lined tin for 45-55 mins at 150 degrees Celsius. Garnish with coconut for a frosty feel and top it up with a cherry and mint leaves to get set for the Christmas feast. Serve with a hot cup of tea or a glass of mulled wine. Shop for X’mas Goodies and more here. Posted in Delhi, DIY, Festivals, Food, Women and tagged baking, christmas, cooking, date and walnut cake, family, Food, Recipe, wine. Bookmark the permalink.